Of Two Minds - Are Cities the Incubators of Decentralized Solutions? Are Cities the Incubators of Decentralized Solutions? Those urban regions that pursue decentralized, networked, localized solutions will likely prosper as the adaptive advantages of these principles pay self-reinforcing dividends. In yesterday's entry, I suggested that rather than bemoan the inevitable failure of centralized "fixes," let's turn our efforts to the real solutions: decentralized, networked, localized. To commentators such as Richard Florida, decentralized, networked, localized describes cities. He describes the transition from central states imposing solutions to cities being the incubators of solutions as The Most Disruptive Transformation in History: How the clustering of knowledge lays bare the need to devolve power from the nation-state to the city. 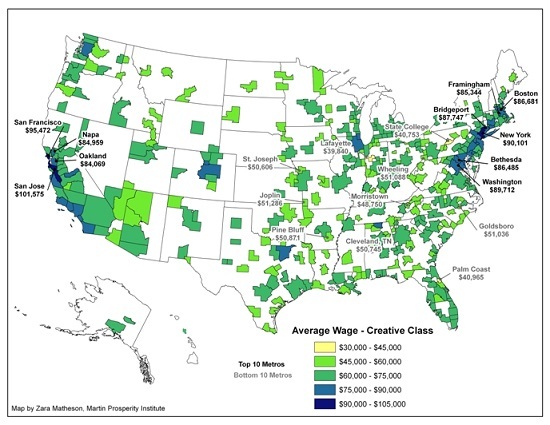 Florida has authored three books on the increasing concentration of the "creative class" and capital in urban zones--cities and their surrounding satellite cities, suburbs and exurbs: The Rise of the Creative Class and Who's Your City? : How the Creative Economy Is Making Where to Live the Most Important Decision of Your Life. More recently, he addressed the soaring costs of living in these urban area in The New Urban Crisis: How Our Cities Are Increasing Inequality, Deepening Segregation, and Failing the Middle Class—and What We Can Do About It. Florida's main thesis is straightforward: solutions are coming from city governments, institutions and enterprises, not central states. Since the world's populace has rapidly urbanized, this transformation affects the majority of people in both the developed and developing worlds. I've often written about the need to move from centralization to decentralization: centralized command-and-control mechanisms are optimized for the economy and society of the late 1940s - early 1960s, not the economy/society of today that is being creatively disrupted by the 4th Industrial Revolution (digital communications, software, automation, robotics, Internet). Florida's premise makes a great deal of common-sense, for the basic reason that different cities face different problems (or different versions of the same problem), and each regional mega-city is embedded in a different state and economy. Cities also have different resources and dominant political cultures. In effect, devolving political power to cities would enable a suite of local solutions rather than a single "fix" imposed by a topdown centralized authority. This article illustrates the spectrum of cities (the categories are somewhat arbitrary, of course): The Megacity Economy: How Seven Types Of Global Cities Stack Up. 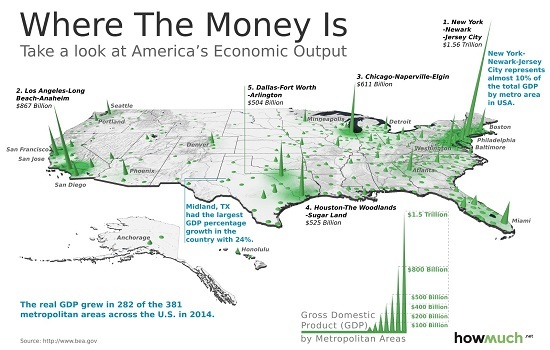 To understand why the city may be the ideal political-social-economic unit to manage successful adaptation, look at these three maps of the U.S. 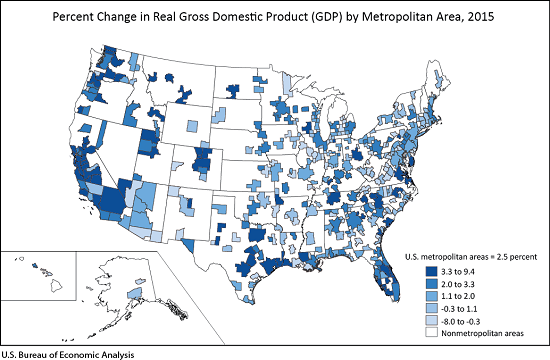 The first reflects the GDP generated within each county; the second shows real growth in GDP by region, and the third displays the wages of the so-called "creative class"--those with high-demand skillsets, education and experience. Those urban regions that pursue decentralized, networked, localized solutions will prosper as the adaptive advantages of these principles pay self-reinforcing dividends. Those urban regions that pursue the hierarchical, one "solution" fits all, high-cost bureaucratic model of central states will sink into the same cesspool of corruption, cronyism, sclerosis and failure to adapt that characterize central states. Thank you, Robert F. ($50), for your superbly generous contribution to this site -- I am greatly honored by your steadfast support and readership. Thank you, Bob B. ($10), for yet another extremely generous contribution to this site -- I am greatly honored by your steadfast support and readership.